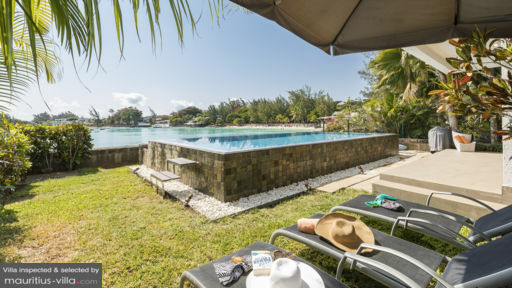 Located on the scenic coast of Pereybere, Villa Elegance is ideal for small groups and families looking for accommodation in Mauritius. 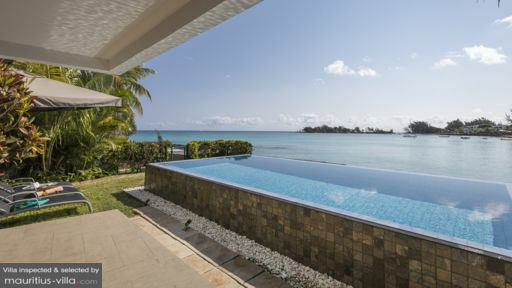 Brimming with luxurious touches, this splendid villa lies just one minute from the beach, which means that you’ll be able to enjoy the glorious waves whenever you feel like it. With all the cozy comforts of a holiday home, this villa is indeed entirely designed to ensure that your holiday in Mauritius are as enjoyable as possible. It is set in a luxurious complex nestled in the middle of emerald green foliage. Villa Elegance boasts three bedrooms to very comfortably accommodate up to six guests. 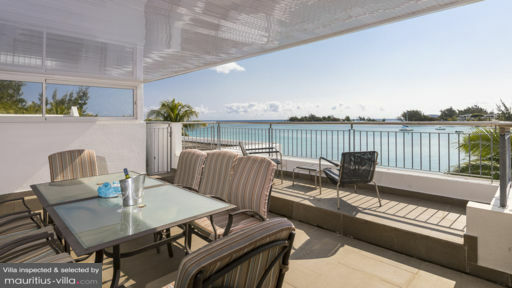 The master bedroom features spectacular views of the sparkling ocean, as well as its very own private terrace where you can enjoy your morning coffee while watching the sun rise over the horizon. The bedrooms are equipped with king bed, queen bed, 2 single beds and en-suite bathrooms. Each bedroom also comes with coffee and tea making facilities. Villa Elegance boasts a large tropical garden, ideal for catching some of those famous tropical rays. In the garden, you’ll find sunbeds on which you can lie back and relax while working on your tan. In the garden, you’ll also find an infinity pool which is perfect to cool off after a long day of exploring Mauritius. The swimming pool overlooks the bay, creating a glorious haven of tranquility and peace. There’s also a barbecue area where you can gather with your friends and family for a fun Al Fresco meal. The spacious and airy living areas of Villa Elegance are designed to feel just like home, but with added luxury and comfort. There’s a large living room, complete with sofas and a flat-screen television with international channels. A dining area overlooking the bay only serves to enhance the overall charm of the villa. Because Villa Elegance is entirely self-catering, you will also find a fully equipped kitchenthat boasts all the amenities that you will need to prepare your own meals, such as a coffee maker, refrigerator, gas stove, microwave, electric oven and more. To ensure that your vacation goes without a hitch, a variety of services have been set up to meet your needs. For example, as a guest of Villa Elegance, you won’t have to worry about tedious housework like doing the dishes since you will receive the visit of a complimentary housekeeper every day. Upon request, you can also book the services of the in-house chef who can prepare local and international dishes alike, as well as customized menus based on your own personal preferences. A short drive from the villa is found the vibrant hub of Grand Baie, where you’ll find all the best restaurants and nightclubs in Mauritius. If you would like to indulge in some shopping, head over to the city capital of Port Louis which is around thirty minutes from Villa Elegance, where you can browse through colorful souvenir stalls.